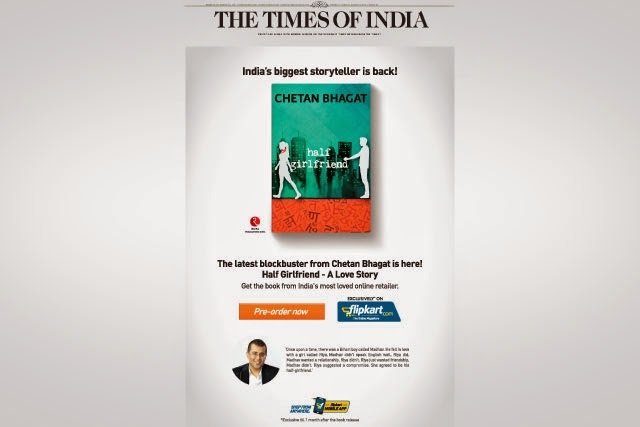 The author, the columnist and the award winning screenplay writer, Chetan Bhagat was the spotlight of the evening with the International launch of his latest book ‘Half Girlfriend’at the 33rd Sharjah International Book Fair on 14th November 2014. The Director of Sharjah International Book Fair, Mr. Ahmed Al Ameri and External Affairs Executive Mr. Mohan Kumar, officially launched Chetan Bhagat’s latest book, ‘Half Girlfriend’. Throughout his years in the field of literature he understood that some writers write just to win awards for acclamation. However, Bhagat’s main goal has always been something far different from other pioneers of the literary field. A goal through which he can reach out to maximum people and create a change through his writing, a positive progressive change in the mindset of individuals which can enhance the life of every individual. “You have to thrill, excite and surprise. If you are not reinventing it is boring. And competition comes in. Always try to do different things. Passion in intentions can be told. People can say if you have passionately done your job or not. So, make sure your passion is there when you are doing something,” he said. He believes that change is a fact of life. And that today’s world is changing so fast that if you don’t know how to change, it won’t happen. Hence, changing the game is nothing but, winning by adaptation. There are winners who do it better than others and there are winners who change the game. Just by changing the game we can win even if we are not the best. Sometimes, it happens by chance. Sometimes, it is a habit and then there’s a strategy. When Chetan Bhagat’s first book Five Point Someone got published, almost all writers were writing high complex vocabulary books. While nobody was writing simple books, his book turned out to be one of the “first simple books” for young adults. “Write in a simple manner, and engage more people,” he said. Bhagat said that he himself was unaware of the fact that the percentage of people who liked simple English and wanted simple vocabulary in books, was high. That was how his journey began. He was surprised when he came across an advertisement of his book “Half Girlfriend” by Flipkart on the cover page of Times of India on 5th August. He said that this came as a welcome surprise since it had never happened before and nobody had ever advertised a book like this in the history. “The title Half Girlfriend is such that, I have never had a book where the title has generated so much curiosity. People have been asking-‘How can one have a half girlfriend? Well, you have to read the book to find out’,” he said. “Ultimately I’m doing what I believe in. And that is what I’m trying to convey. That people may say don’t do this don’t do that. If you really believe in it, you have a plan; you should just go for it. And people will consider it too. It doesn’t matter if it’s in Hindi or English. What you say matters. Language doesn’t matter in fact because of that snobbery is where Half Girlfriend was born. It’s about a boy who doesn’t know English. So, it’s an English book about a boy who doesn’t know English and he’s only writing the book,” he added. He also spoke about “leading the industry” as one of the steps to achievement and how his competition is not with any writer, but his competition is only with Candy Crush, as children today spend half their time playing Candy Crush. Bhagat mentions that his main aim in creating a title like “Half Girlfriend” is to capture and deviate the attention of students from playing Candy Crush and spending time on Whatsapp, to making them read his book which would not only make children efficient readers but would also make them aware of what his book ‘Half Girlfriend’ highlights, i.e., the reality of rural areas in India.